I learned that who doesn’t look for you, doesn’t miss you and who doesn’t miss you doesn’t care for you… That destiny determines who enters your life, but you decide who stays… that the truth hurts only once and a lie every time you remember it. That there are three things in life that leave and never return: words, time and opportunities. 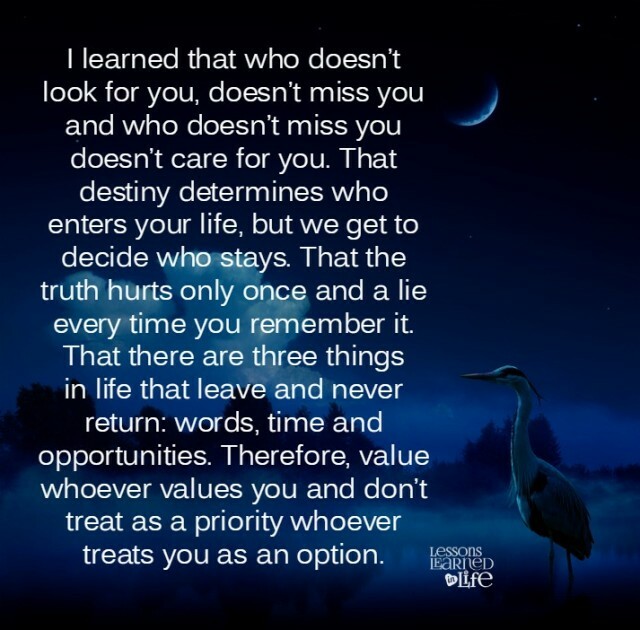 Therefore, value whoever values you and don’t treat as a priority whoever treats you as an option. 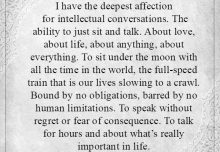 To just sit and talk. 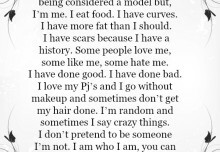 I make no apologies for who I am. I ,along with many others, find your picture quotes so inspirational ! I want to share them with so many people. Some don’t have computers. I print out quotes and make collages and put them in large picture frames. BUT, why is your site the only one (that I’ve encountered-I have many) that won’t allow anyone to “save” the quote? When I “save” on other sites, it goes directly into my photo stream (apple user here!). I’m not techy savvy, but is there a way to do that? I feel that since your site promotes motivation, life, truth…you would encourage the “saving process”. Just thought I would share my opinion. Thanks. Hi Rosie, I will try to help you. Once you are on the website, if you are on the “Quote of the day” page, you can easily “Save image as’ or you can click the little blue (F) under the poster, and that will share, (put) the poster on your facebook wall, (There is also the other social icons beside it, such as twitter, google + to do the same). On the website, on the ‘Home page” it is a little bit different. If you want to save a quote, you have to click on the poster/image to enlarge it. Once you do that, you can save the image. Or once again, use the (f) blue to share it to your facebook wall. On your facebook wall, you can also share it from there, by using the share button that is underneath the poster. I’m interesting with your writing. It’s perfect. Good job. Thank you so much for your words of wisdom it really inspires us.A very helpful site and i love reading it all….